The Google Playground event may be cancelled but that doesn’t mean we don’t have new news about the LG Nexus 4. 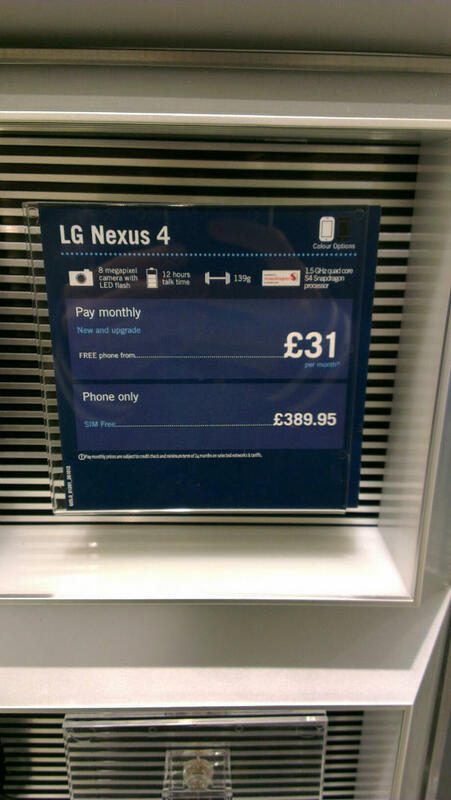 Last week, Carphone Warehouse all but confirmed the existence of the LG Nexus 4 and gave us a glimpse of how much the device will cost when their pre-order page for the device went live ahead of schedule. The page went down a few hours later but it was enough to get fans of the upcoming device all riled-up. If you’re still not convinced and need more details on the device and how much it will cost you, the same retailer has been spotted to be carrying more ads and promotional materials for the device that should remove all doubt. As you can see from the image above, all the information we gleaned from the pre-order page last week has been pretty much confirmed — 1.5 GHz quad-core processor, 8 MP camera, 12 hour talktime all packaged in a svelte frame that weighs just 139g. The contract and non-contract prices for the LG Nexus 4 is also prominently displayed in the ad — free at £31 per month for new and upgraded contracts or for just £389.95, you can get one for yourself outright. The only thing that’s missing is if it will be available in just 8 GB or if a 16 GB variant also exists. I guess we’ll have to wait for the Google Playground event for that one. Are you looking forward to the LG Nexus 4? What other features are you hoping Google will announce regarding the device on the Google Playground event? Discuss in the comments below!